Shown with optional sternum pad. I decided to get a massage chair because my husband, my daughter and my friend (aka: my clients) all suffer from various muscle issues, mostly located on the upper back and shoulders. My massage table being used elsewhere (and the lack of space to open it in my home) caused me to turn to the chair as the best tool. There are many massage chairs on the market, but ultimately I decided the best one for me was the Oakworks Portal Pro. I chose the Sage Terra Touch upholstery, and decided to upgrade the face rest cushion to their Boiance cushion. I received the chair 5 days after ordering it, and excitedly opened the box… The chair comes with a DVD to help you learn all the features of the chair as well as give you some self-care practices. The video that is on the DVD is available online here if you’d like to view it yourself. There are several key features and adjustable points on this chair, so let me start from the bottom and work my way up. On the very bottom are the legs that touch the floor – the front has a set of rubber caps on the ends, and the back include a set of wheels that make it a cinch to roll once it’s folded flat. I have hardwood floors in my home, so I was concerned that when my client was in the chair and I used significant pressure, the chair might slide. My concerns were unfounded – the chair remained solidly in place whether it was my 6’0″, 200+ lb husband or my 4’11”, 85 lb daughter. Oakworks Portal Pro from the back - please excuse the photo, my phone is on it's last legs. Click the pic for a larger view. Moving up along the seat bar there are two adjustable points to note. The first you will encounter is the z-clip (the bottom arrow in my picture). When the tension is released on the cable (simply fold the chair a little), the z-clip can be easily repositioned to another hole. This will allow the chair to raise or lower to best accommodate the therapist’s body mechanics. 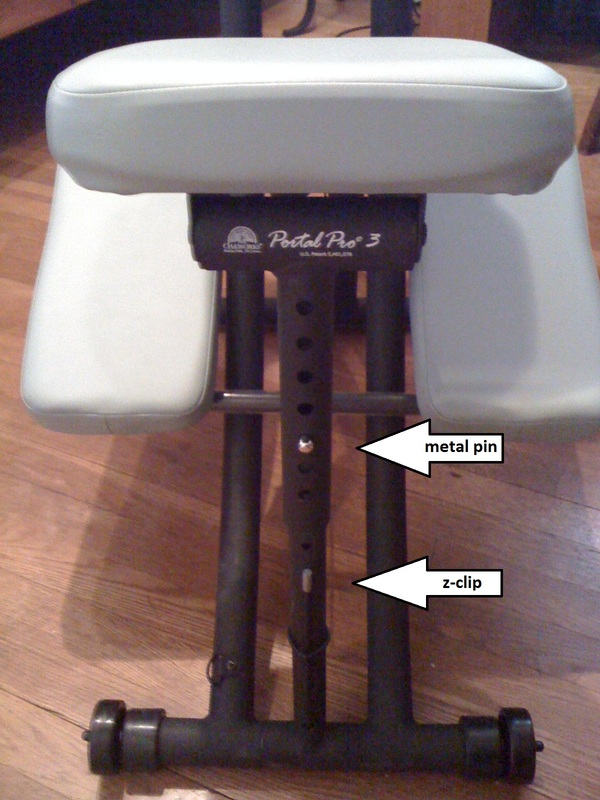 Once a good height is found, the seat itself may be adjusted for client comfort simply by depressing the metal pin (shown at the top arrow in my picture) and sliding the seat to the next hole. These are really great features in an of themselves. There are therapists and clients of ALL shapes and sizes in the world, and for someone on the tall side (I’m 5’11”), it’s awesome to be able to adjust the chair to best fit my needs and save my body from unnecessary strain. The Oakworks Portal Pro from the side, again, sorry for the poor picture quality. Click the pic for a larger view. Further up you will come to the arm rest, which can be tilted toward the client, away from the client or horizontal to the ground – whatever works best! There is a strap that is easily adjustable, as well as a cam-lock that helps with tilting (the bottom arrow in the picture). The chest cushion itself is adjustable, as well. The plate it rests on is not, but the cushion is velcroed to the plate, and can be completely removed and reattached higher, lower or even horizontally to accommodate larger chested clients. Then we come to the face rest, which uses Oakworks’ QuickLock platform and is adjustable in three places. There are two cam-locks (you can see them in the picture), which allow both clients the greatest comfort and therapists better accessibility to the neck and shoulders. Additionally, the face rest can be pulled up away from the chest plate or pushed down against it – the prongs where the face rest slide into the chair are simply tightened into place with two knobs. It goes without saying that the face rest cushion is also completely removable so it can be rotated or repositioned as needed. Aesthetically, the chair is gorgeous! I absolutely love the Sage color I chose (my photos do not do it justice), and the Terra Touch upholstery is very soft and supple. The upholstery has come a long way since I was a massage student, I still can’t get over wonderful it feels. The Boiance cushion is also fantastic! As you can see from my side-view picture, the face rest looks pretty thick, and with a less adjustable platform, it might be uncomfortable, but I am really pleased to have gone with this upgrade. All my clients have found the chair so comfortable, they have nearly fallen asleep in it. The chair is not the lightest on the market, nor is it the heaviest. To be honest, if it were much lighter I think it would feel less “solid” – if you’re looking to save a couple pounds, though, stick with the standard face rest cushion, as the Boiance is heavier due to the unique innards. When folded, there are several options for transporting it – simply wheeling it, using the shoulder strap, or using the carry case. There are only two negative things I could find with this chair. The first is that due to cold temperatures, the parts inside the Boiance cushion can freeze, so leaving the chair (or at least the cushion) in your car overnight during the winter is not going to make your clients very happy the next day. Obviously this is easily fixed by bringing the cushion inside, but it’s an added step some people might find a hassle. The second is that a canvas pouch to hold a client’s glasses, rings, watches, etc would be a great thing to have on the chair. This seems like something very easy to add, and I hope Oakworks considers it for future models. In the interest of full disclosure, my business does sell these massage chairs (along with several other massage chairs, tables and accessories). However, I am not writing this review as a business owner, I am writing it as a massage therapist. I have found so few reviews of massage chairs based on real world experience that I thought it might be helpful for therapists who are looking to expand their practice with chair massage in addition to table massage. If you have any specific questions I may not have answered in the review, please leave a comment and I’ll be happy to help. Enjoy! 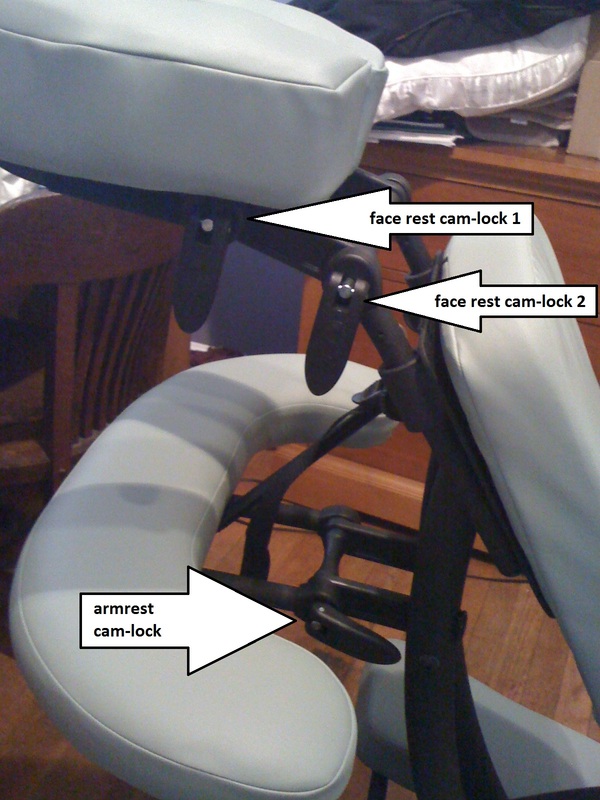 Posted on March 12, 2012, in Reviews and tagged Boiance, massage chair, Oakworks, Portal Pro. Bookmark the permalink. 1 Comment.